While the previous chapter focused on adding support for CDM in your model, and adapting your model to using CDM, we will now focus on all aspects of the day-to-day use of a CDM-enabled application by the end-users of your model. Most CDM functionality is implemented in a white-box implementation in the section Branch and Revision Overview Support of the AimmsCDM library, with some low-level functionality like determining and dealing with individual differences of identifiers at the tuple level, as well as all interaction with CDM service implemented through external functions in the CDM DLL. This approach allows you to inspect most of the inner workings of CDM, and, together with inspecting the log files produced by CDM, will help analyze any problems there may with your CDM setup. Before diving in deeper into day-to-day operations you will need to learn some more general version control concepts used by CDM. All data in a CDM data repository is organized in one or more branches. When a new CDM application database is created, it will start with two standard branches, the system branch and the master branch. The system branch is not used to record any data changes, but solely to record administrative events as discussed here. The master branch is the initial branch used to store data changes to the data of identifiers in any CDM category of the application at hand. Any commit to a branch will lead to the creation of a new revision on that branch, based on a parent revision. The parent revision represents the state of the application data just prior to the changes being made to the application’s data, that were committed to constitute the new revision. The CDM library will always maintain the state of the application data corresponding to a given revision in the CDM data repository, and thus is able to determine the individual changes of all identifiers in a particular CDM category compared to the state of that revision, and commit the collective of all individual changes to the CDM data repository as a new revision, with the given revision as its parent. When checking out the data for a CDM category from a given branch in the CDM data repository, the CDM service will collect the latest values for all changes committed to all revisions on that branch for all stored tuples of every identifier in the category, and pass the collective of these latest stored values on to the client requesting the checkout, allowing the client to restore the exact application state at the latest revision on the given branch. The initial revision on the master branch represents the empty state, i.e. the state where no application data whatsoever has been stored yet. New branches can be created based on any revision in the data repository. The initial state of any branch equals the state of the revision on which it is based. All branches created in the CDM data repository, as well as the revisions on all branches, can be inspected visually on the Branch and Revision Overview page of the CDM library, as shown below. From this page, one can also execute the most common version control operations via the context menus of the Category and Revision lists. For day-to-day use the CDM library provides two APIs. The high-level API is used through right-mouse menus from within the Branch and Revision Overview page in the CDM library to perform the most common version control actions on the data in your model. The functions in the high-level API use the low-level API to combine various version control actions to implement their requested actions. If the high-level behavior is what you are looking for, you can use this API within your own code as well, by setting the above element parameters as appropriate and calling the high-level functions. The low-level API is implemented in the DLL that comes with the CDM library. This API connects with the CDM service and exposes the full capabilities of the CDM library, and allows you to implement custom actions that are not implemented by the high-level API. The methods exposed by the high-level API can serve as an example from where you can implement your customizations. Whichever API you use, make sure to check the return values of the CDM methods you call. Typically, if there is some problem with your CDM setup, e.g. because of incorrect dependencies, checking out the data is likely to fail. Not only will this confuse your end-users, if they don’t get notified of the problem, but, also, such errors may not set the state of the CDM library correctly, causing subsequent commits to fail as well. The low-level API functions, will all return 1 if successful, or 0 otherwise. If you use the low-level API functions, you have to carefully check the return codes, and take appropriate action when a call fails. When a low-level API functions fails, it will call the procedure cdm::SetError, which registers all occurring errors and their stack locations in the cdm::ErrorMessage and cdm::StackProcedure parameters, which can be checked programmatically, or viewed from the List of Errors page in the CDM library. When checking the return code, you can also use these messages to report the error back to the end-user. In addition, cdm::SetError will call the procedure pointed to by the element parameter cdm::OnErrorProcedureHook. By default it calls the empty procedure cdm::EmptyErrorProcedureHook, which you can replace by your own implementation. You can use such a hook to report errors back to the user, or, for instance, to automatically raise an error, that you can catch in an onerror block in your own procedures that call low- or high-level API, if you happen to like an exception-based error handling approach. If you do not provide an on-error hook yourself, you should still check the return values returned by the low- or high-level API methods. The high-level API will check the low-level API error codes, and return on failure. If you have set a cdm::OnErrorProcedureHook that raises an error when called, you can catch the errors that occur both during low- and high-level API methods from within an on-error block in your code or through the global AIMMS error handler. In all other cases, you should carefully check the return values of the high-level API methods. This section discusses the basic actions you need to know to get started using CDM: how to retrieve the current data from a branch and how to commit changes. The high-level API function cdm::CheckoutSelectedCategory will only checkout the category pointed to by cdm::SelectedCategory to the latest revision of cdm::SelectedBranch. The low-level API function cdm::CheckoutSnapshot will checkout the specified category, branch and revision. Through the optional arguments labelsOnly and skipInactive you can indicate whether you only want to retrieve the label translation for all relevant element spaces, or that you also want to retrieve *inactive* data. When some data in your app has changed compared to the state of the latest stored revision on the current branch, you can commit the local changes to the CDM database. The high-level procedure cdm::CommitSelectedCategory performs the commit on the current branch of the category pointed to by cdm::SelectedCategory, and subsequently updates all other categories on the same branch to the committed revision. This will make sure that further commits to such categories will not fail because of being out-of-date compared to the latest branch of the selected category you just committed to. The low-level method to commit data is cdm::CommitChanges() which will only commit the changes for the selected category provided to through the provided procedure argument. Committing data will fail when when the data in your client session is not at the latest revision of the branch in the CDM database that you want to commit to. In such a case, you must first pull all changes from the CDM database to get your client to the latest revision on the current branch, and resolve any conflicts that may arise between the remote changes that you pulled in and the local changes that you actually want to commit. After you successfully pulled in the changes and resolved any conflicts, you may re-commit your local changes. With version control, it is a common practice to specify a commit comment in which you can describe, to some extent, which changes you made why in this commit. Along with the commit author and date , both of which are already added by the CDM library, this will allow you to inspect the list of changes made by multiple users of your application later on, and where necessary revert or re-apply change sets from the list. You will get notified whenever other users of your application have committed changes to the data you have checked out in your AIMMS session, at which point you can decide whether or not you want to pull in these changes. When you do not automatically pull in such changes, it is good to realize that, when you want to commit local changes of a category to the CDM database, you are only allowed to do this when you are at the latest revision of the branch that you have currently checked out of that category. When you have made local changes to the identifier data of a category, pulling in the changes of new revisions from the CDM database, may lead to merge conflicts which you need to resolve. These merge conflicts arise from differing changes being made to the same tuple(s) of the same identifier in the change set being pulled in, and the local changes being made by the user on top of the latest revision being checked out in this session. Without further intervention, the CDM library will let remote, already committed changes, prevail over local changes. Conflict resolution is discussed in more detail here. the high-level API function cdm::PullCategoriesSelectedBranch pulls in changes for all categories that are on the branch pointed to by cdm::SelectedBranch, to bring them to the latest revision of that branch. the high-level API function cdm::PullSelectedCategory pulls in changes for the category pointed to by cdm::SelectedCategory. the low-level API function cdm::PullChanges() pulls in changes for the given category, to bring them to the latest revision of the current branch of that category. The output argument resolved indicates whether there are any unresolved conflicts after pulling in changes. This section discusses how you can undo changes, or selectively (re-)apply changes in commits made by yourself or others. As long as you do not have yet committed the local changes you have made to the identifier data of a CDM category, you can undo such changes by rolling back all identifier data to the state of the revision of the branch that you have currently checked out. As AIMMS will have this state stored in shadow identifiers in the CDMRuntime library, rolling back is just a local action, i.e., it does not require the CDM library to connect to the CDM service to perform the rollback. call the low-level API procedure cdm::RollbackChanges() which will roll back the category provided through its arguments. Even when you have committed local changes to the CDM database in one or more commits, you can still roll back changes, in this case accomplished by reverting the state of you local data back to the state of a previous revision as retrieved from the CDM database. The high-level API function cdm::RevertCategoriesSelectedRevision will revert the content of all categories to the state at cdm::SelectedRevision on cdm::SelectedBranch. The low-level API function cdm::RevertToSnapshot() will revert the content of only the category indicated to the branch and revision passed through its argument list. After reverting the state of the local data to the indicated revision, it’s up to you to commit these changes to the CDM database if you so wish, either by explicitly committing the changes to your current branch, or, when *auto-commit* has been set for one or more categories, the CDM library will automatically commit the changes caused by reverting the selected branch. After committing the newly created revision, the CDM database will, at the newly committed revision, actually contain the identical data as on the selected revision to which you reverted. You can selectively apply changes made by yourself or others into your own branch by cherry picking changes made in other commits. You should be aware that changes made in such a commit can be dependent on elements being added in other commits. In case the element is not known yet in the branch you are working on, cherry picking such a commit will fail unless you prior cherry picked the commit introducing the new elements. Cherry picking can be a convenient tool when you have reverted your branch to the state of a previous revision, but do want to include some of the changes that have been committed afterwards. the high-level API method cdm::CherryPickSelectedRevisions which will cherry pick all revision in order set in the identifier cdm::RevisionsSelected for cdm::SelectedDB and cdm::SelectedBranch for the category cdm::SelectedCategory into your current branch. You would typically use this method after selecting the revisions to cherry pick in the Branch and Revision Overview page of the CDM Library. the low-level API method cdm::CherryPickChanges() method will cherry pick a range of revisions from the indicated branch of the indicated category into the current branch of that category. The output argument resolved indicates whether conflicts with any local changes in the category data have been resolved successfully. The CDM database can simultaneously hold various different versions of the state of your application’s data. These different states are called branches. Branches are created off a particular revision on a given branch in the CDM database, which then defines the initial state of the application data on the newly created branch. Any commits to such a new branch will then alter the initial state of the branch, but will leave the state of the branch from which the new branch was derived, unaltered. Thus, branching will create a tree of revisions, where the state of each revision is either based upon the state of its parent revision on the same branch plus the local changes committed in that revision, or upon the state of the revision of a given branch at which a new branch has been created. You can use branches to create completely independent data sets. This is particular true of you branch off revision 2 of the master branch, which represents the empty data set in any CDM database. However, you can also create independent data sets by branching off a revision that already holds data that is common to all the independent data sets you want to create. You can switch between the various data sets created in this manner, by checking out the corresponding branches. When you already have a data set from which you want to create multiple scenarios, you can do so by creating new branches at the revision in the CDM database representing that data set, one for each scenario you want to investigate. On each new branch created in this manner, you can commit the changes that make up the scenarios you want to investigate. By checking out the branch that represents a particular scenario, you can work with that scenario in your local session. You can then further adapt the data for that scenario, or perform an optimization run. Eventually, if you have decided that you want to continue working with a single scenario, you can merge the corresponding branch back into the branch representing the original data set from which all scenarios were created. This will add all the individual data changes you made as part of the scenario to the original data set. call the low-level API function cdm::CreateBranch() to create the branch as specified through its arguments. Notice, that creating a branch will not check out your local session to the newly created branch. If you branched off the revision currently checked out in your local session, you can simply change the revision to the initial revision of the newly created branch using the low-level API function cdm::SetRevision() (as both revision actually hold the same data). To obtain the head revision of the newly created branch you can call function cdm::EnumerateBranches(), after which you can obtain the head revision from the identifier cdm::BranchHead. If the data in newly created branch differs from the data in your local session, you should perform a full check out to the newly created branch. If you do not check out the newly created branch, but instead try to only set the revision to the head revision of the newly created branch, you will leave the internal data state of your client session in an inconsistent state, which will lead to possibly incorrect commits being performed when you want to commit local changes on the new branch. AIMMS CDM also allows you to delete branches from your repository. This is an inherently dangerous operation, as deleting a branch will not only delete the branch itself, but also all branches that are derived from the branch that you delete, and all data on these branches. You cannot delete the protected branches system and master. 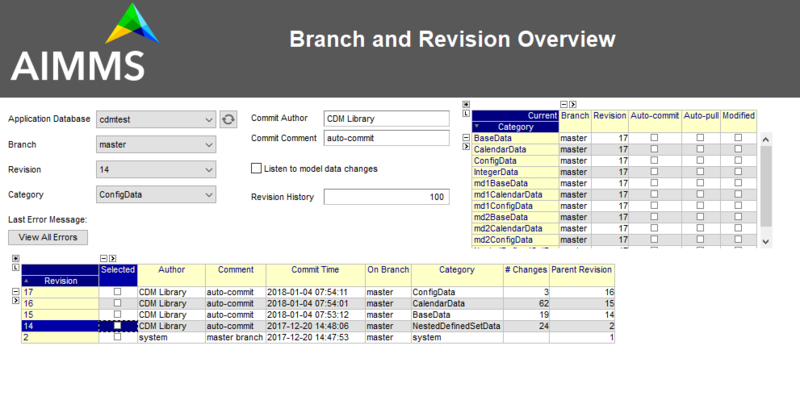 update the set cdm::Branches and cdm::Revisions to remove the all branches and revisions deleted from the CDM database. call the low-level API function cdm::DeleteBranch() to delete the branch as specified through its arguments. In the branch comparison identifiers AIMMS CDM allows you to compare multiple scenarios, the data of which is stored in multiple branches in the CDM database. You can directly display the contents of these branch comparison identifiers in either the Windows of Web UI. Please note that these functions will add elements to the domain sets in the actual model, i.e., corresponding to the content of the current branch, if the data of held in the branches being added to the branch comparison identifiers are not present in the current branch. Without adding such elements, the branch data cannot be added to the branch comparison identifiers. Therefore, if you want to use the branch comparison functionality, you are advised to temporarily disable auto-commit functionality if applicable, and revert the data of the current branch when you are done comparing scenarios before committing to the current branch. After you have committed one or multiple changes to a particular branch, you may want to merge such a branch with another branch. For instance, you may want to merge the changes you made to data for a particular scenario you examined, back into the branch on which the scenario was based, because that particular scenario represents the desired action you want to implement for the main branch. After you have been working with a given branch for a longer time, most probably only the most recent commits make sense to retain, as individual data changes in the past may have become obsolete, and may lead to longer checkout times, as the current branch data must be reconstructed from a larger amount of commits. Through the function cdm::RetireBranchData, you can replace the cumulative changes for all categories from the root of a particular branch up and until a given revision by a single snapshot containing the same change set. You can retire commits all branches except the system branch. If the resulting branch is not the master branch, the resulting branch will be relocated to branch off revision 2 of the master branch, as the snapshot can only be guaranteed to produce the right result if there no preceding commits. The function works by first creating snapshots for all data categories on a temporary branch, subsequently deleting all intermediate commits from the data repository, injecting the snapshots into the branch as a single commit, and finally deleting the intermediate branch. Note that if data set to default (or for which elements in the domain are deleted from the root sets) after the snapshot, will still be stored in the data repository, although they will not be visible in any checkout. Only when such commits will be included in a snapshots, such data deletions will be completely removed from the data repository. Custom: use a custom procedure to resolve conflicts. By default, the interactive conflict resolution mode consists of a very generic dialog using identifier names to present the individual conflicts. Before you can start using the interactive conflict resolution mode, you have to generate the identifier-specific pages used to present the conflicts to the end-user. You can make more clear to your end-user what the actual conflicts are about in their terms by providing values to the string parameter cdm::UserIdentifierText for all relevant identifiers. If you provide a descriptive string here, it will be used in the conflict resolution or differencing page, otherwise the identifier name will be used. The generic conflict resolution dialog may be overwhelming for end-users. We therefore advise to select either the AlwaysUsingRemote or AlwaysUsingLocal modes to let CDM resolve conflicts automatically, unless you really see a need for your end-users to resolve conflicts visually. In the latter case, you should at least provide descriptive text for each possible identifier that makes clear to your end-users what part of the regular UI the conflicts are actually about. The interactive merge uses the the non-interactive merge facility in CDM which you can call through the procedure cdm::MergeBranches. It will merge the data for cdm::SelectedCategory for the revision pointed by the cdm::SelectedRevision on cdm::SelectedBranch into the current branch for cdm::SelectedCategory. select the conflict resolution methods to use when merging, through the element parameter cdm::SelectedConflictResolutionMethod. If all conflicts are resolved successfully, then the result of the merge will be committed as a new revision on the current branch for cdm::SelectedCategory, and cdm::MergeBranches will return 1. If the conflicts could not be resolved successfully, your repository may be in an undefined state as a result of the failed merge, and you are advised to checkout the category cdm::SelectedCategory to the head of its current branch again. For any project containing the CDM library, you can create a generic UI for visually resolving merge conflicts and viewing differences between revisions as follows. By default, the pages thus created will be shown in the conflict resolution dialog or the data difference page by their identifier name, which may be confusing the end-users of your application. You can change the text displayed for each identifier by specifying the identifier text you want to display through the string parameter cdm::UserIdentifierText. If your project is stored in a source control repository itself, do not forget to add the pages just created to that repository. Please note that you should re-generate the pages for the conflict resolution dialog whenever you add new identifiers to your CDM categories, or when you make structural changes to existing identifiers in any CDM category. This will make sure that the conflict resolution dialog will remain showing the correct information. By default, CDM leaves it up to you when to commit your changes, or when to pull changes committed by other users who work on the same branch. That’s usually a great approach for strategic or tactical applications, or when you work on scenarios that you don’t want to share yet. When your application becomes more operational, however, your end-users will most likely want to see changes made by other users as soon as possible, as operational apps typically work with on a single data set, represented by a single branch in your CDM database. Whenever a user commits a change set for a given CDM category to a particular branch in the CDM database, all other users connected to the same category will get a notification from the CDM service that a revision has been committed for the given category and branch. You can instruct CDM to automatically pull in such changes by setting the parameter cdm::AutoPull to 1 for the category at hand. CDM will then pull in any commits for that category which take place on your current branch. It will skip all commits on other branches. By setting cdm::AutoPull you make sure that your client session is always up-to-date with the CDM database, and with all other clients who use this setting as well, regardless of the manner of how local changes are committed. Call the procedure cdm::StartListeningToDataChanges() to instruct the CDM library to react to data change notifications of the AIMMS engine. Whenever this procedure has been called, the CDM library will examine all identifiers in all categories upon a data change notification by the AIMMS engine, and register any change in any CDM category. If the parameter cdm::AutoCommit has been set for a category, then the CDM library will automatically commit the changes to such a category as soon as they are detected. By setting cdm::AutoCommit you increase the concurrency of your app even more. With these settings, you make sure that other client sessions will always be up-to-date with any changes you make as soon as they occur. The behavior described above is actually implemented through the procedures cdm::DefaultCommitInfoNotification and cdm::DataChangeProcedure passed as the defaults of the (optional) arguments notificationProcedure and datachangeProcedure to the procedure cdm::CreateCategory(). By specifying other procedures with the same prototypes you can further customize the behavior of your app with respect to incoming commit notifications and detected local data changes, if the need arises. Through the function cdm::GetValuesLog() you can obtain the history of a given parameter reference on the current branch, from a given revision. The history is stored in the shadow parameter corresponding to the given parameter reference in the ValueLogIdentifiers and ValueLogDomainIdentifiers modules of the CDMRuntime library. As the full history may be very large, and retrieving it may be very time-consuming, the procedure accepts only a reference to a single parameter slice, and only for this slice the history will be retrieved. This allow use cases, where you are able to retrieve and display the history of a single field in the UI of an AIMMS app at very low cost, or to retrieve and cache the history of a larger slice at higher costs, and display a sub-slice directly from the shadow identifiers. Although CDM itself offers merge-style version control facilities for AIMMS data, the facilities offered by CDM also allows one to easily implement locking-style version control at the application level. A working approach to accomplish locking-style version control is to introduce additional parameters into your model with the sole intent to lock specific resources in your model, and add those parameters to a category for which auto-commit and auto-pull is activated. Now, when you want to lock specific resources within your application, you can do so by checking the resource for availability and lock it by setting the lock parameter to 1 for the resource at hand. When committing these changes, all other client apps will be automatically notified of the lock change, and henceforth the resource will be locked for all other clients until it is unlocked by the client possessing the lock.